This top is normally done in conjunction with others on the Glenbeigh Horseshoe, and it is almost impossible to access in isolation. The simples approach is via Drung Hill. Heading west from Glenbeigh turn off the N70 V630 890 A and follow the narrow road for about 1km to point V622 888 B, where there is room to park a couple of cars on the roadside. Picture from simon3 : Soft and sharp. 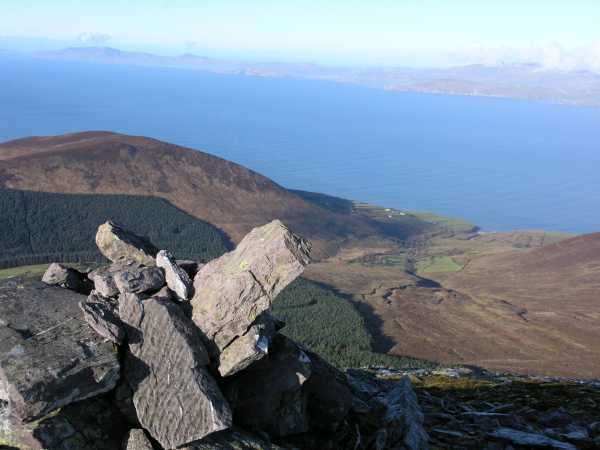 This route takes in not just the classic Glenbeigh horseshoe but includes most of the extra summits to the east. The route starts at Glenbeigh and takes a minor road heading south for 1km before turning left onto the Kerry Way which is followed to a col. Turning right at the col leads to the start of the traverse and the first summit, Coolroe. If time permits it is also possible to turn left at the col to make a detour out and back to Seefin. In addition, again if time permits, it also possible to traverse out and back to Colly. But including Seefin and Colly on this traverse would make it hard to complete these and the whole traverse in a day (we did Colly alone the next day). The highlight is probably the spectacular knife ridge traverse out and back to Keamconneragh (a traverse perhaps to avoid on a wet or misty day where a slip might have serious consequences). The downside to the route are the numerous peat hags in many of the cols (and some of the summits) which make for slow progress. Highly recommended film by two of Ireland's top mountain moviemakers.